Today, I’d like to start with a very important announcement: after so many months of work, our next RCA course will be ready this month! For now, I will just tell you that it will be called “Unlocking the Grandmaster’s Mind”. I’ll let you know more details in the coming days, so stay tuned, as we might even provide some nice offers along the way. 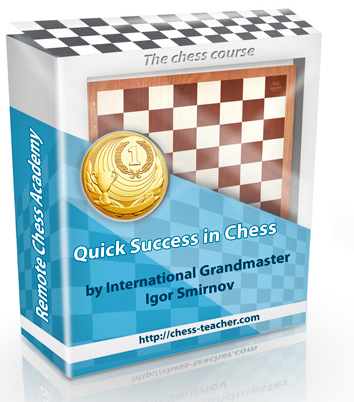 In RCA, we are working hard to support your chess progress and provide the best tools and tutorials for you. For that reason, we’ve prepared a survey and would ask you to take part in it. If you let me know YOUR personal needs and preferences, we’ll be able to help you in the best possible way. The survey is anonymous and I’d appreciate your honesty! Moreover, you’ll get a nice present at the end! NOTE: You’ll get a FREE webinar (premium video) as a present after you complete the survey. For that purpose, you need to enter your e-mail address in the required field in the survey. It might take 7-10 days to receive the present. In the previous article, we discussed “Hanging Pawn Structures” (HPS) in a famous game between Kasparov and Portisch. Let’s continue our study of that game. We stopped after 16.exd4 16…Na5. So it is White’s turn now. How would you play here as White? 17.d5! A thematic move! White opens the centre and activates both his bishops. 17…exd5 – if Black chooses to take with 17…Nc4 18.Qe4 g6 20.Bxc4 Qxc4 21.Qe5 f6 22.Qxe6+ Rf7 22.Rc1 Qa6 22.Nd4 and White has the upper hand. 18.cxd5 Bxd5 – White has eliminated the HPS and has opened his bishops for a kingside attack. How can White start an immediate attack in the above position? White goes for a tactical blow 19.Bxh7+ Kxh7 20.Rxd5; White is threatening to play Qe4+ followed by Rh5. 20…Kg8 A natural strategic retreat by Portisch, but anyway who can stop the Force! 21.Bxg7!! A bolt out of the blue! 21…Kxg7 22.Ne5 centralizing the knight in an open position; pieces are best placed in central squares, opening up the diagonal for the queen. Preparing to move rook to d7 and also to play Nd7, preventing the queen from supporting the bishop with lot of threats. 23.Qg4+ Kf8 24.Qf5 threatening a simple mate on f7. How should White continue his attack now? 28…Kf7 29.Rd3 A brilliant waiting move; only A FORCE can play like this. Now White threatens to play Qh7+ – forcing Black to play Ke6! 29…Nc4 30.Rfd1! Bringing the least active piece into the game. 30…Ne5? Moreover, if you want to learn such skills and use them in your games, then you definitely will have to study the course “Your Winning Plan”. Additionally, I’ve discussed the point about the ‘least active’ piece (mentioned above at move 30) in my other course “GM’s Positional Understanding”.